Last weekend, while some of us were blessed by the inspiring and great music from the Nidaros Cathedral Boys’ Choir, three mission teams visited regional cities to share the love of Christ. The new “Healing of the Nations” ministry was inaugurated with the sending of a team to Medan in Sumatra from the 19th to the 22nd May. The ministry was led by 2 members of the 8am service – Joshua Lee & his wife Ai Leng who have both also been key volunteers with the Mobile Medical Clinic. The team of 12 included 2 doctors. 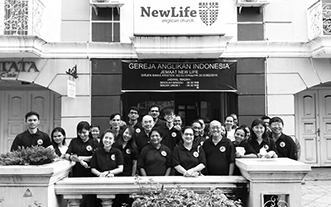 This medical mission was conducted in conjunction with 2 churches of Gereja Anglikan Indonesia – the New Life Church led by Pastor Josepha Tarigan and the Church of the Good News led by Pastor Untung. Over the course of the mission, the team, together with the local volunteers from the two churches treated and ministered to more than 500 poor villagers in 2 locations near Medan – Sri Gunting & Desa Namo Rih. Many of the villagers also received prayer. A children’s ministry was also conducted at both locations with the children receiving balloon animals as well as gifts kindly donated by an 8am service member.It was a truly blessed time of serving the Lord and glorifying His name in Medan. This ministry will be providing medical missions to other locations in the Deanery countries. The next mission will be in September to Yogjakarta. Pas Geraldine led a team of 8 young adults to visit Ho Chih Minh over the same weekend. One of our members, Joshua Kwok is doing a 2-year stint there. Going with a faith attitude to serve and to expect the unexpected, the team had some interesting experiences of being a blessing to the locals. While surviving the heat was exhausting, the team was refreshed by the opportunity to serve. Another team of eight, under the ministry of 289 Fellowship, visited Kampung Nanas in Batam, Indonesia. Apart from distributing food and meeting other needs, the team is seeking to help uplift the lives of the locals. Paul Ramani, one of the regular helpers said, “We feel that simply giving donations e.g. rice or money is not enough and will not help in the long run. They are not asking for charity but to be given opportunities to help earn sustainable and regular incomes. This is where we feel we have the tools to help. We will be making regular visits and follow-ups to Kg Nanas and will expand our reach from 43 to 100 Christian families.